This podcast medieval Ireland stand of the edge of a precipice. A rootless struggle for control of the O Neill kingdom breaks out in the North, while in Munster a new comer to the podcast – the Dal Cais challenge the King of Munster for power in the South. While Ireland is on the verge of chaos we look at these wars and how people struggled through a very tough period of not only war but famine, hard winters and an out break of leprosy and dysentery. By the end of the show Medieval Ireland will have changed and Brian Boru will have started his rise to power. Clarifaction: In this episode I refer to the following quote “Abnormally severe frost so that the lakes and rivers were passable on foot.” at 1:45 minutes in. The quote is form the Annals of Ulster and not from the Annals of the Four Masters as I said. Congalach mac Mael Methig (d956) Often referred to as Congalach Cnogba, he was the king of Brega. In 944 he took control of the Southern O Neill kingdom, the first person to oust the Clann Colman family from the position in 200 years. Ruaidrí ua Canannáin (d950). Ruairdrí was king of the Cenél Conaill who took control of the Northern O Neill kingdom in 943. He was the first person outside the Cenél Eoghan family to rise to the position in 2oo years. Domnaill Ua Neill. (d 980). Domnaill lead the Cenél Eoghan back to power in the North when Ruairdri died in 950. When he became highking in 956 after Congalach’s death he spent several decades putting down various rebellions. 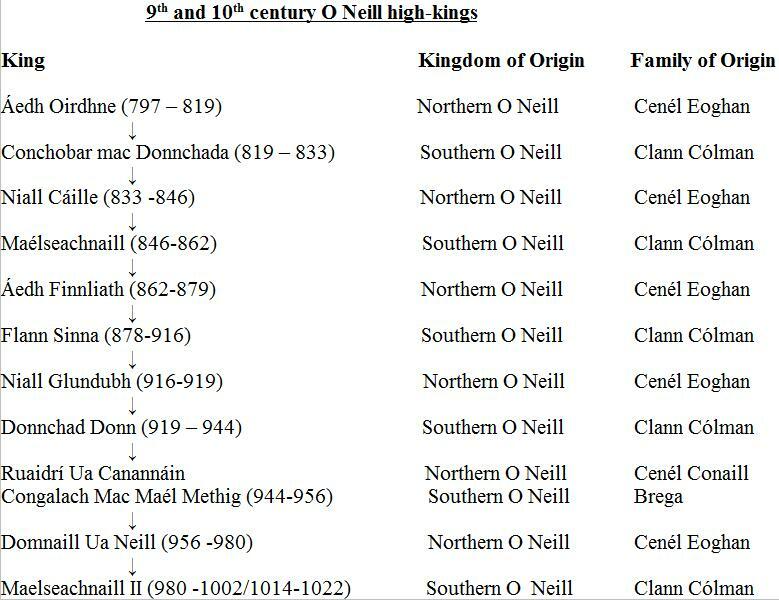 His surname Ua Neill (not O Neill) highlights the fact that he was the grandson of Niall Glundubh. Its in this period that the O Neill surname comes into use coming from Niall Glundubh himself. Domnaill’s father Muirchertach was called Muirchertach Mac Neill (mac meaning son) illustrates the fact he was Niall Glundubh’s son. You can hear more about Niall Glundubh in episode 5 and Muirchertach in episode 6. Amlaib Currain (Am-laave – Kurawn). Son of the famous Viking Sitric Caech who recaptured Dublin in 917 and killed Niall Glundubh in 919. He was the great-grandson of King Ivarr the boneless (see episode 4) and his royal lineage saw him take the Viking kingship of York in the early 940’s. He was ousted from this position in 943 after which he disappears from the record for 2 years. In 945 he arrived in Dublin forcing his cousin the king Blacaire into exile. He left Dublin in 948 to attempt to take back York. He failed and returned To Dublin sometime in the 950’s or 960’s. This period in his life is very unclear compounded by the fact another Viking King Amlaib lived during the same time. Brian Mac Cennetig (Brian Boru) took power in 976 after Mathgamain’s execution and became the most successful king of the Dal Cais in history. I wont ruin the story for those who have not yet read about Brian but his life even if misrepresented in history is a fascinating story. Brian is one of the most famous individuals in Irish history but also one of the most misunderstood. This is largely because a 12th century account of his life An Cogadh Gael re gallaimh (which was a highly unreliable) formed the basis of many popular historical interpretations of Brian Boru. The cogadh is a highly questionable but influential resource, see link below. Its importance is not beacuse of its content per se but more because it was used to form the narrative of the popular story of Brian Boru’s rise to power. As you shall see in this episode the real story is far more interesting if complicated. This episode spans the reign of several O Neill high kings and the succession of high kings can be quite confusing. This is largely due to the fact the position was rotated between the Northern and Southern O Neill until the mid 10th century. Hopefully this makes it a little easier to understand.